This topic contains 9 replies, has 5 voices, and was last updated by norm smith 2 months ago. Yes, it’s that time again! 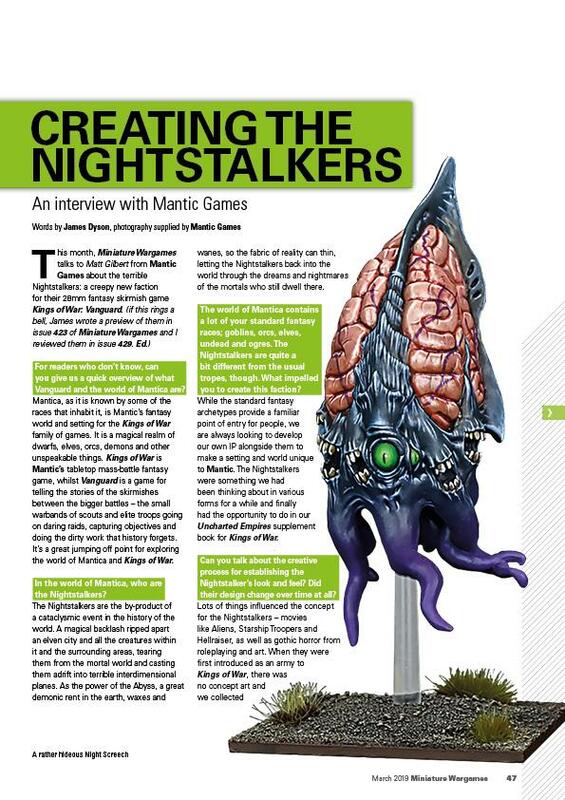 Issue 431 of Miniature Wargames is almost with us. What do we have for the readers? 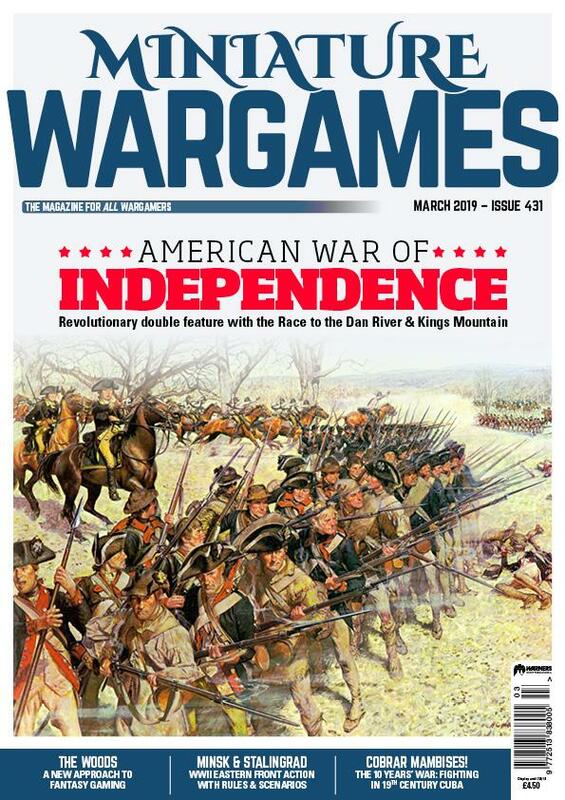 On the cover – with an evocative piece of artwork – we an American War of Independence double feature with Kings Mountain. 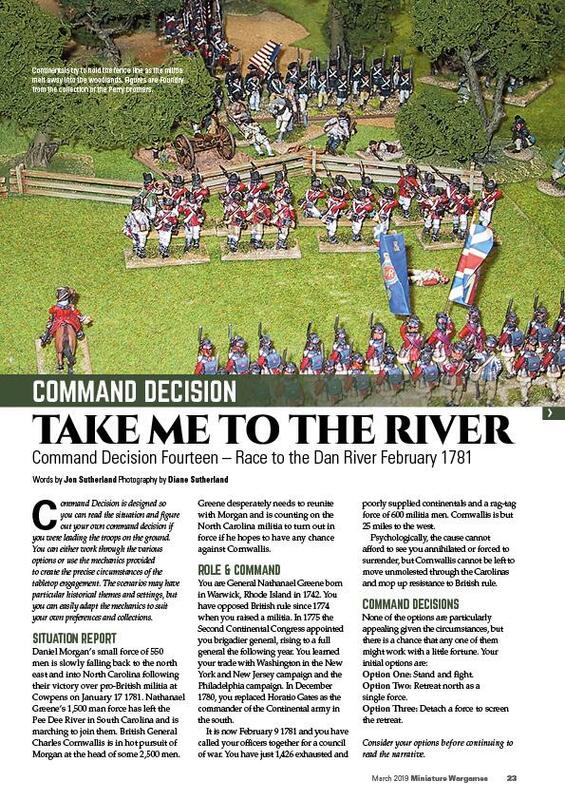 This has rules plus a scenario and – if that wasn’t revolutionary enough – we have Command Decision the Race to the Dan River February 1781 by Jon Sutherland. Staying in that hemisphere but moving forward in time we have Cobrar Mambises! 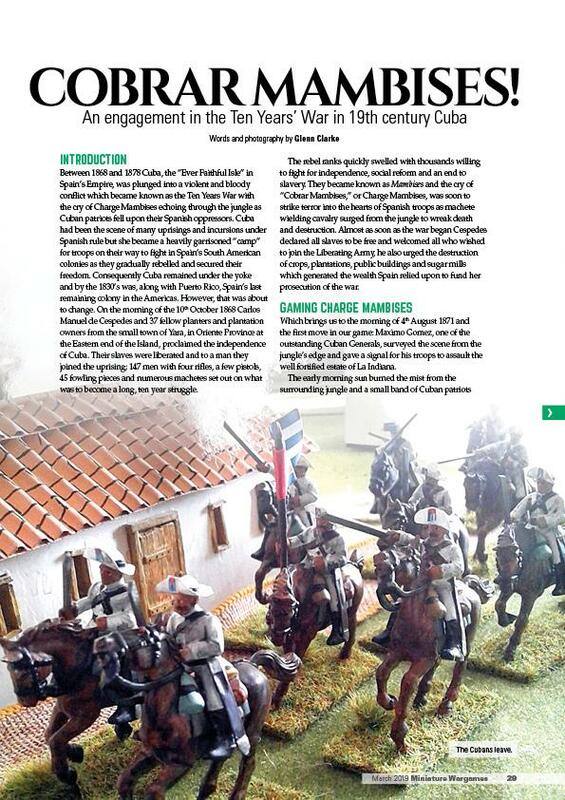 This has scenarios and figure suggestions for gaming the Ten Years War in 19th century Cuba. 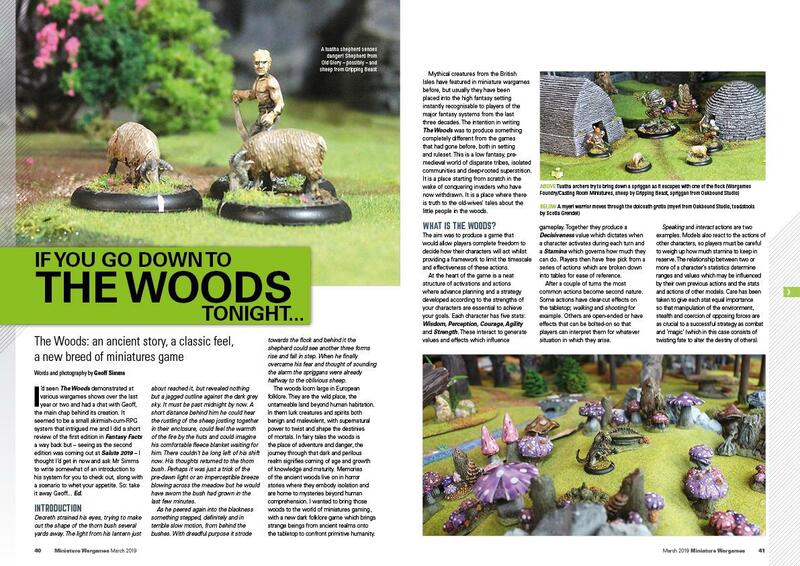 The Woods is new approach to fantasy gaming with a scalable system – we have an introduction to the second edition by the author and it includes a sheep rustling scenario! For WWII enthusiasts we have two Eastern front pieces with Tigers at Minsk which is a hex based table top game in 15mm (with downloadable rules) and – linked to that – Surviving Stalingrad: a setup for gaming the epic struggle. And there’s Forward Observer with (mostly) historical wargaming product reports North Star’s Prussians; Offensive Miniatures’ Winter Germans; Tiny Terrain; Perry Miniatures’ Agincourt plastics and more! Finally we have Recce for a massive 15 book reviews. And the free Club Directory! Looks packed. Some good stuff there, plus free rules. Woot! That is one of the best magazine covers I have seen in ages, also interesting to see my Tigers at Minsk rules form the basis of an article … looking forward to this issue. Thanks Norm: you are credited in the article too! Thanks John, from the photographs, the game looks beautifully modelled, lit and photographed. But I’ve been led to the conclusion that variety is the spice of life! As someone who is going to buy the magazine regardless of the cover, I can see that the image may affect the impulse purchasers. I would just add that if you are going to feature figures and models on the cover then, IMHO, they need to be the best, like the Tigers at Minsk photos. Norm, this is awesome! Congrats! Thanks, it looks like the author of the piece has done a spendid job. Miniature Wargames issue 431 (March 2019) is out at WH Smiths (UK high street stationers). 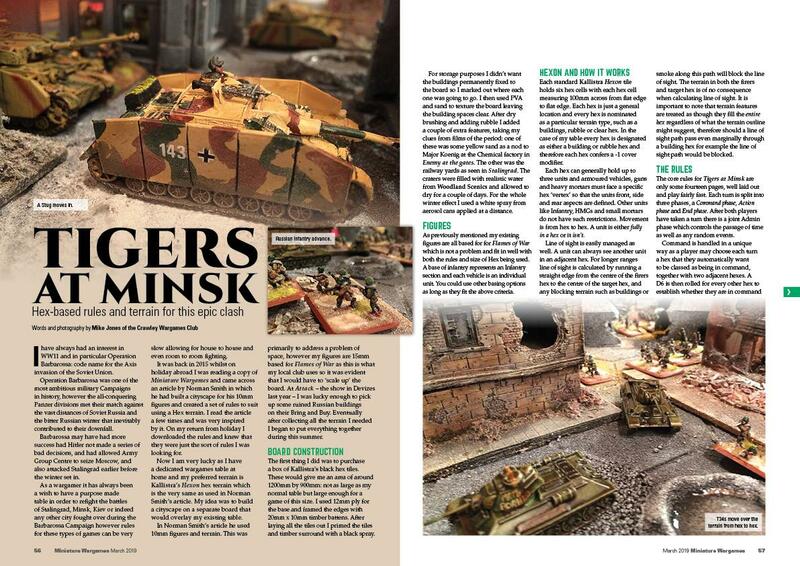 There is a lot of interesting stuff in this months issue and I say that without any consideration for the Tigers at Minsk article that Mike Jones submitted that highlight my (free) WWII hex based rule set. This issue feels very much like a ‘wargamers’ magazine and I think this is reinforced by the splendid cover, which takes me back to the style use in the old Practical Wargamer magazine that brought so much wargaming pleasure. 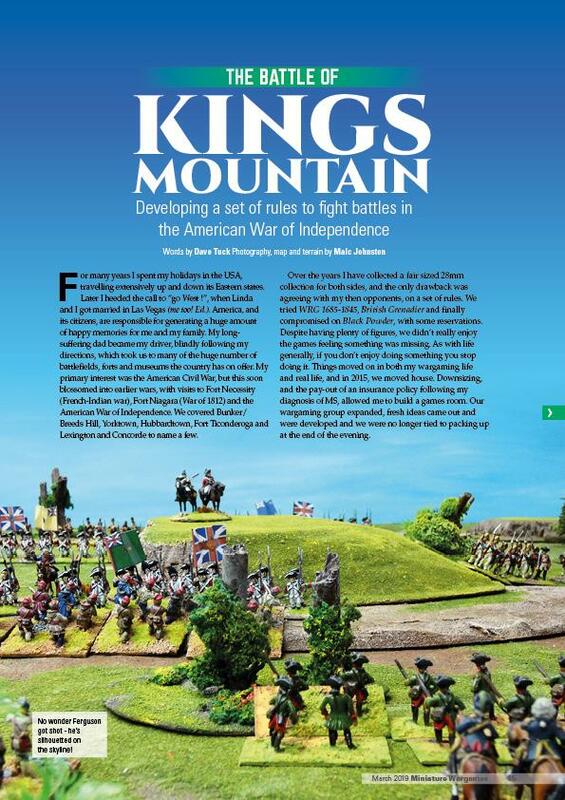 There is a bit of theme around the American War of Indepenedence that includes a home brew set of AWI rules (Edit – I like these) together with a Kings Mountain scenario to go with them. The second part of Conrad Kinch’s Battle of Alma done with figures on hexes (Commands and Colors style) is eye catching and there is an interesting skirmish scenario on a Cuban plantation (1868 – 1878) with the mention of Sharp Practice rules. So overall, a good cover-to-cover read issue, more-so than usual I would say.